Los Angeles is a destination that should be seen at least once in life. And not only for its Hollywood sign, the beaches of Malibu or the savoir-faire of Beverly Hills. It is a city that should be lived as a native more, and that involves going to trendy places to eat. See and be seen, here is its philosophy. And today we show the 6 directions that should not miss on your GPS if you want to try delicious donuts. 2) Blue Star Donuts: 1142 Abbot Kinney Blvd, Venice Beach. Venice Beach is one of the coolest places in the city of Los Angeles, and Abbot Kinney Street is the busiest street. Thousands of businesses are grouped next to one another, and that is where we find Blue Star Donuts. This so famous delicacy is presented in all its varieties, making the chocolate, salt and almonds is a complete hit. 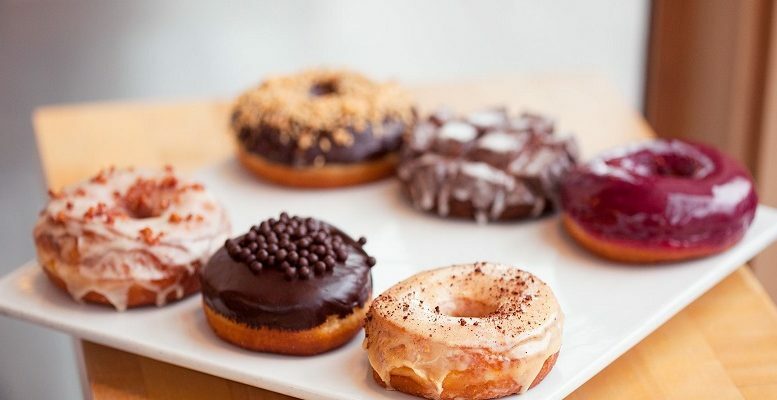 3) Sidecar Doughnuts & Coffee: 631 Wilshire Blvd, Santa Monica. With a city hipster aesthetic and well in Santa Monica we found the earthly paradise of this sweet so famous. Does the version and while striking star? Your donut with poached egg inside and ham. 4) DK’s Donuts: 1614 Santa Monica Blvd, Santa Monica. Variety is the spice, and in this place, there are many versions to opt for one will be a very difficult task. From the velvet network, passing the chocolate biscuit and ending with pistachio. What is your favorite flavor? 5) Bob’s Coffee and Donuts: Farmers Market, 6333 W 3rd St # 450, Los Angeles. One of the most iconic places of this great city is the famous Farmer’s Market. Located in West Hollywood, this place has everything: bars, restaurants, cafes and even shop stickers (is to be seen that is very curious). And we also find this paradise where simple versions donut … None. 6) Donut Friend: 5107 York Blvd, Los Angeles. Imagine a perfect flavor to your donut. Now another … and another. Now mix them in the same round mass. Here are the versions of Donut Friend where countless flavors and ingredients create true culinary masterpieces. Be the first to comment on "6 Best places in Los Angeles to gobble a donut"